Posted by Patrick on February 5th, 2015 in How Should I Participate? Every so often, a message will cross my stream where someone is complaining that Twitter doesn’t work for them, they aren’t getting much out of Twitter, or they are simply done with it. That’s cool, everyone is different. But I’m actually enjoying Twitter more now than I did a year ago. I have used Twitter to improve myself and to strengthen my connection with the people I care about most on the service. I wanted to talk about how that applies to my work in community. People follow 10,000 people and wonder why they don’t get much out of Twitter. If you are in a room of 10,000 people sharing their thoughts, you can only catch random ones from random people. I follow 2,142 people, all manually. I unfollow people somewhat frequently and trim that list once in a while. The people I follow are people I want to know, for the most part, so I do dip into that main stream once in a while. Professionals that I know and think highly of. People I want to get to know better. I want to know everything my close friends say. I want to read thoughts of the professionals I really respect. But that last use is really valuable. When I discover someone I don’t know, but want to know, I’ll add them to this list to see the types of things they talk about. If I like what they are doing, I interact with them. It’s a very easy way to break the ice and enter someone else’s world. This can lead to other things – friendship, professional opportunities, etc. But at the core, it’s just someone I want to know. It’s very natural and genuine. Twitter is a great way to get to know (a slice of) someone. 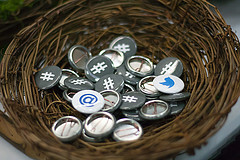 I monitor the #cmgrchat hashtag somewhat regularly to catch various community related links, questions and discussions. I tweet with the hashtag myself, but I generally don’t use it to promote my work because I feel weird about that. If I write something worthwhile, people will share it. I don’t need to do that. I mute people in that stream when they promote their own articles, events or whatever too much. If they make something great, someone else will share it, and I’ll see it that way. Notifications (specifically retweets and favorites only). A custom search of websites and Twitter names that are associated with me. Twitter is what you make it. By taking a little more control and using the tools they offer, I have really increased my enjoyment in using the service, grown my professional network and improved my work.